Patricia Racette as Marie Antoinette in The Ghosts of Versailles at the Dorothy Chandler Pavilion in 2015. 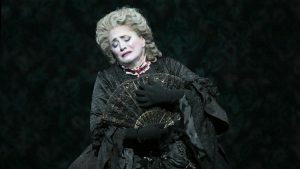 Twenty-five years after it was first performed at the Metropolitan Opera, The Ghosts of Versailles—composed by Distinguished Professor of Music, John Corigliano with a libretto by Theatre Professor William M. Hoffman—continues to rack up awards. In 2015, the Los Angeles Opera staged the work, in all its original, lavish production glory. Then at last month’s Grammys, the acclaimed opera, originally commissioned by the Met in 1980 to coincide with its 100th anniversary, won Grammys for Best Opera recording and Best Engineered Classical Album. Both Grammys were for the L.A. Opera’s 2015 cast recording released last April. Corigliano is one of the most celebrated composers of our time. His music has garnered international acclaim and has been played by many of the most prominent orchestras and chamber musicians in the world. He has also won a slew of awards ranging from five previous Grammys, the Pulitzer Prize, the Grawemeyer Award, and an Oscar for his soundtrack for The Red Violin. He has taught at Lehman College since the early 1970s. Hoffman’s play As Is, was one of the first to focus on the AIDS crisis. It opened on Broadway to critical acclaim in 1985 and won both a Drama Desk Award and an Obie. It was also nominated for a Tony Award. He has published a dozen plays and also written librettos for operas, such as Morning Star (which premiered at the Cincinnati Opera) and The Cows of Apollo (with my music by Chris Theofanides). He retired from Lehman College last year.